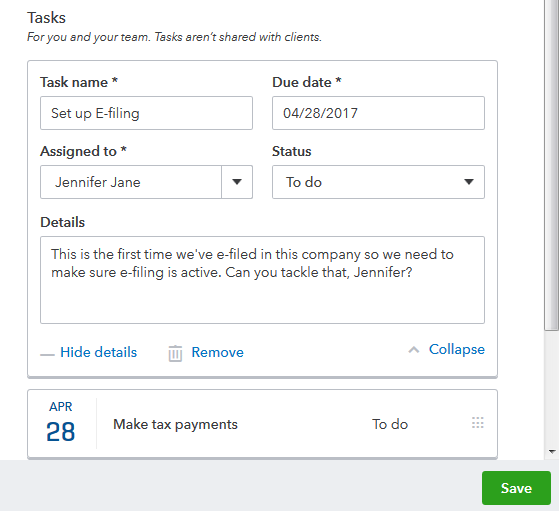 The Practice Management feature, found under the Work Tab of QuickBooks Online Accountant, allows you to create three types of items to track your work: client requests, projects, and tasks. Client requests are for asking your clients to do something for you, such as answering a question, uploading a document, or doing some work in their company. Your request will appear in the client's company under the My Accountant tab. To send a new client request, select Create client request. The Create client request panel opens. Request name: The title that displays on both your Work tab and in the client's My Accountant tab. Client: The client company that receives this request. Any user with Company Admin or Master Admin rights is able to view the request. Due date: This tells the client when you need this request completed. You can't choose a date in the past. Status: This allows you to set the request's starting status to something other than To do. You don't usually have to change this when creating a request. Details:This is optional. It displays beneath the Request name. Use to provide more information to your client. Documents: This is optional. 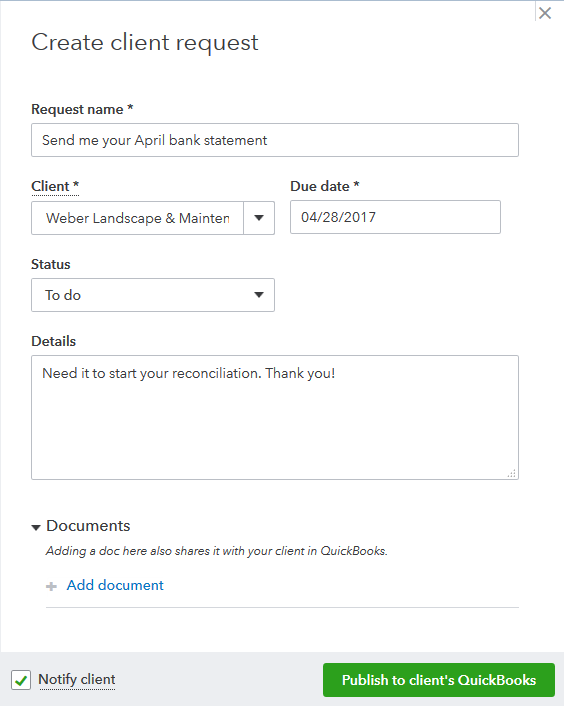 If you upload a document using the Add documentbutton, it appears in your client's My Accountant tab along with the request. Notify client:If this checkbox is checked, you'll be prompted to compose an email to your client to let them know you sent them a request. 3 When you are happy with the request, select Publish to client's QuickBooksto post it to your Work tab and the client's My Accountant tab. Projects are used to track large chunks of work your team needs to complete. Tasks, on the other hand, represent individual parts of that work that need to be completed before the Project can be considered done. Projects and tasks aren't shown to clients. They're for your team to track and manage your work. Project name: The title that displays on both your Work tab and in the client's My Accountant tab. Client: The client company that this work pertains to. The client does not see this nor is the client notified of this project. Due date: Indicates when this work needs to be completed. If you have tasks, their due dates must come before the project's due date. Assigned to: Select a team member who will be responsible for this work. You can't choose a team member who doesn't have access to the selected client. Status: This is optional. It allows you to set the project's starting status to something other than To do. This isn’t usually necessary. Details: This is optional. It displays beneath the Project name. Use it if you need to provide more information for yourself or your team. 3 (Optional) You can then add tasks to break down the work. The fields on each task work the same as they do for the overall project, but they apply to this individual task instead. A task may have a different status, assignee, and due date than its project does. Once again, the task's due date must come before the project's due date. Hide/Add details: This allows you to add or remove the Details box. Remove: This deletes this task and removes it from the project. Collapse: This shrinks the task into a smaller view. Select it to expand it again. You can only have one task expanded at a time. Add task: This is not shown in the screenshot above. It is located at the bottom of the list of tasks. Clicking it adds a new task item for you to fill out. 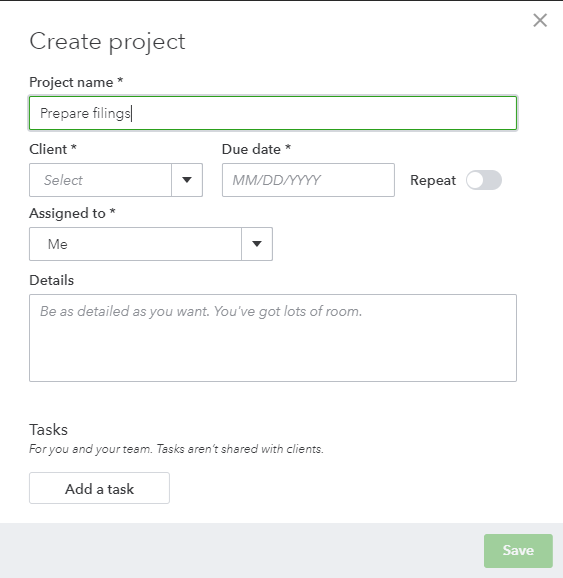 4 When you are satisfied with your project and any tasks you've added, select Save to record it in the Work tab. Each task is tracked as its own item, as is the overall project. You can make a copy of an existing project to use as a template to quickly create new work items. This also duplicates the tasks underneath that project, which you can remove or edit as necessary. Find the project you want to duplicate. If it has already been completed, you may need to use List view to see it. Select on the work item to edit it. Make any desired edits. Your changes only affect the new, duplicated project. Now you know how to organize client requests, projects and tasks.